An analysis of the demand for data recovery services by regions shows that Madrid is the autonomous community that has requested the most data recovery services, with 36.77% of total demand. 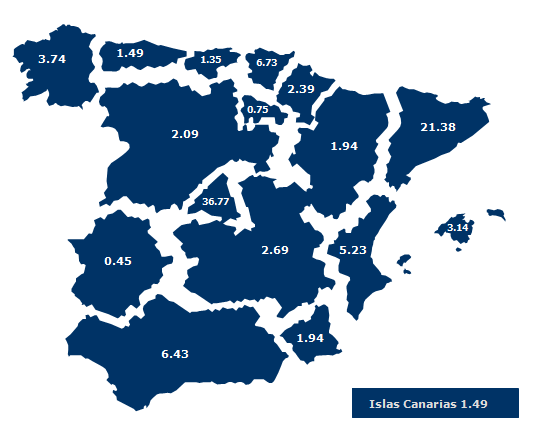 After Madrid, Catalonia is the next autonomous community in terms of demand with 21.38% of the total. The Basque Country comes in third with 6.73% of the total, followed closely by Andalucía and Valencia, with 6.24% and 5.23%, respectively. The number of requests for services went down in Cataluña to 2008 levels and represented 23.41% of the total. The Valencian Community lost its position in the ranking in favour of the Basque Country and Andalucía. However, despite the percentage variations, these autonomous communities continue to make up the bulk of the requests for our services. The type of device for which data recovery services are most often requested is once again the 3.5” hard drive, with 47.77% of demand. Despite a 5.65% decline in the volume of devices processed in our laboratory, hard drives have held this spot for more than four years. Next are 2.5” hard drives, which are the ones most affected by data loss, accounting for 38.23% of the total, following a 12.12% jump in demand in the last two years. Hence we see the request for data recovery for 2.5” hard drives rising while requests for 3.5” hard drives are falling. The third and fourth positions are occupied by USB devices and Raid systems (configuration of various hard drives that can be arranged in different configurations “Raid 0, Raid 1, Raid 3, Raid 5 and Raid 6”), accounting for 5.34% and 4.30%, respectively. The evolution of these types of storage devices is notable, with a 2.10% and 1.18% increase in the demand for data recovery services, respectively, compared to the year before. Next on the list are SSD and flash memory cards, each one representing 1.34% of total devices. The volume of devices coming into the laboratory increased just slightly by 1% for SSDs while the volume of flash memory cards declined by 2.39%. Finally, 1.8” hard drives accounted for 0.89% of the total and other devices, including CD-ROM, tapes, diskettes, etc. accounted for 0.74%. Failures due to surface degradation rank first reaching 25.81% of the total. Sudden changes in temperature along with bumps and falls were the main causes of data loss in 2013. Although they account for most of the data recovery service requests, the volume compared to previous years was largely unchanged. This situation is possible because the damage to the heads and coils experienced a sharp drop in registered volume (-4.41%), this year occupying second place with 18.44%, together with those considered as head crash, which by contrast increased by 6.52% of total failures processed in our laboratory. Among the main causes for the rise in this type of failures are an increase in the use of laptops and external hard drives that are exposed to increased risks of blows and drops. Third and fourth places are occupied by structural failures (14.45%) and electronic failures (10.91%), which declined by 1.64% and 1.49%, respectively. 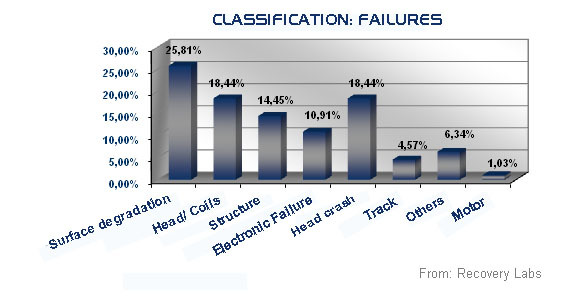 As in previous years, the last places are occupied by track failures (4.57%) and motor malfunctions (1.03%). Madrid is at the top of the list of the Autonomous Communities that have demanded the most data recovery services, with a constant increase in the total volume of requests since 2009 to the point where it accounts for 36.77% of the total, followed by Catalonia (21.38%) and the Basque Country (6.73%). The devices for which data recovery is most often requested are 3.5” hard drives at 47.77%, followed by 2.5” hard drives for laptop computers (38.28%), which experienced more than 6% growth compared to the previous year. Failures caused by surface degradation topped the list in 2013, with sudden temperature changes along with blows and falls accounting for the main causes of data loss.